Like all Vietnam "ports" along the Mekong, your riverboat will anchor in the middle of the Mekong River and you'll take sampans to get from the boat to your destination(s). All tours will be provided by your river cruise line; there is no opportunity for independent exploration. The official currency in Vietnam is the dong. You'll want to have dong in hand by the time you get to Tan Chau as you will not have the chance to stop at an ATM. Any place your tour guide takes you to purchase local items (woven straw goods and silk items are specialties of the region) will also accept U.S. dollars. 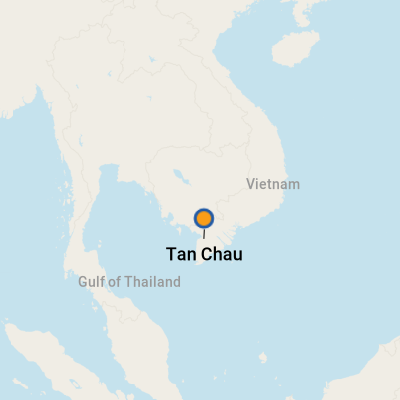 The official language in Vietnam is Vietnamese and few people around Tan Chau speak more than a handful of English words. With its mystical temples, floating water villages and lush tropical landscape, the Lower Mekong River that flows through Vietnam and Cambodia is an ideal itinerary for those who've never been to Southeast Asia. The Lower Mekong is easier to navigate than its northern counterpart, despite some seasonal issues with water levels. Although Vietnam and Cambodia still suffer great postwar impoverishment, especially in rural areas, a significant rise in tourism over the past 10 years has prompted more investments in infrastructure and business in the cities found on Upper Mekong itineraries. Even with its advantages, the Lower Mekong River is not an itinerary that one can just book on a whim; it requires extensive planning and preparation, and this article offers everything you'll need to know. Is it safe to visit? The answer is yes. Although it might not seem like the Vietnam War and genocide in Cambodia under the Khmer Rouge regime happened that long ago, the two countries have overcome their political unrest and continue to see growth in tourism, including the cruise sector. War history is, inevitably, a focus of Lower Mekong River cruise tours. In fact, it's common to see American Vietnam War veterans sailing the itinerary for closure. Despite Vietnam's and Cambodia's grizzly pasts, and the poverty and suffering that continue today, locals are positive, perseverant and spiritual, and they welcome the chance to share their stories with visitors.